Contemporary, cottage, craftsman, French provincial – these terms may mean different things to you than to your architect. The best way to communicate is with photographs. We encourage you to create a scrapbook of photos that appeal to you. Organize it by the room(s) you are renovating – exterior, kitchen, master bathroom, etc… The more prepared and organized you are, the better your architect will understand your goals for your remodeled space. Create a wishlist, room by room. Include features, your plans for using the room, special pieces of furniture you intend to bring and anything else that will help the team understand your vision. These hand-done, sketchy, artistic translations are fun to look at and even more fun to play with. They capture the initial statement of a lifestyle quickly and inexpensively. 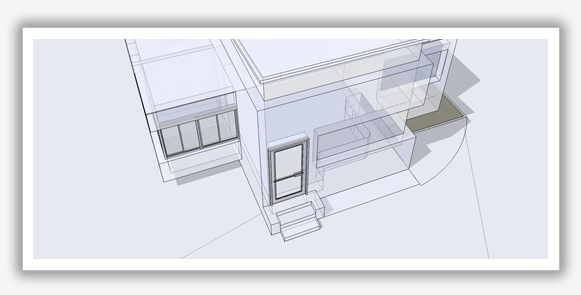 Every architect has their own process, but most will present hand drawn, loose concepts at the first design review. At this stage, it is too early to solicit actual bids from subcontractors. Instead, we’ll target the budget by identifying a expected cost per square foot. We’ll determine this cost based on our experience, and our conversations regarding your amenities, finishes & features of your renovation project. After perfecting the conceptual design, the architect will proceed into CAD drawings. Design will proceed to a set of drawings that can be bid by subcontractors – the ‘bid set’. Once we reach this point, we’ll pause the design process to prepare a formal budget, make sure we’re on track with your budget expectations.